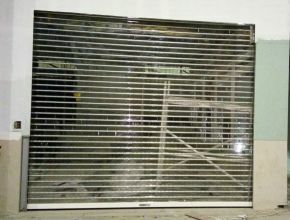 Doors & shade systems have wide range of polycarbonate rolling shutters Dubai, which are installed in malls to have clear transparent visibility & security. The polycarbonate shutters are available in sizes of 300mm & 320 mm width & 5 mm thick. The polycarbonate links are interlocked with each other with 16mm dia 3mm thick aluminium tubes, the ends are closed with pvc caps. The doors can be installed for maximum width of 14 mtrs. The shutters bottom is provided with weather seal & can be powder coated to any color. The guide channels are provided with fabric brush for smooth operation & can be powder coated to any desired color. Doors & shade systems supplies extruded aluminium polycarbonate rolling shutters with flat surface polycarbonate slats, the extruded profiles can be powder coated to any color. The Curtain is manufactured from 300mm x 100mm /320mm x 100mm x5mm thick clear polucarbonate slats interlinked by 16mm dia 2/3mm thick Alluminium tubes & the ends are sealed with plastic end clips. electrically operated with motor by switch & remote control & provided with manual chain in case of power failure/emergency.Photocells,loop ,magenetic lock,fire alarm are additional optional safety features. The guide rails are made from Alluminium Box type & U type & can be powder coated to any color.The end of guide rails are provided with pvc bruch protection to have smooth & soundless operation. The bottom bar is made from Alluminium U shape with weather seal fixed at bottom to suit unlevel floor surface.